Laser Hair Clinics has successfully treated both Men and Women. Most patients say they experience no pain during procedure. Average Procedure is just $2,000 – $3,000. Minoxodil (Rogaine®), Finasteride (Propecia®), and low-level laser phototherapy (both the “hair comb” and in office therapy) are the only FDA-approved solutions for the treatment of hair loss. Nearly Undetectable in Days & Undetectable Hairlines. First Available DNA Testing from Hair & Scalp Clinics. 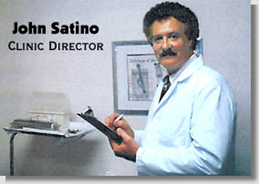 When you visit John Satino in our consultation office you will see dozens of autographed photos from patients ranging from famous musicians, entertainers, and politicians, as well as thank you letters from our continually-growing list of global business professionals, retirees, and more. We remain innovative and lead the industry with affordable, reliable results. Sought after board certified experts located in Clearwater, Florida. Hair and Scalp clinic is globally recognized and welcomes patients from all over the world. All of our methods are FDA approved. Read more in the International Journal of Cosmetic Surgery.